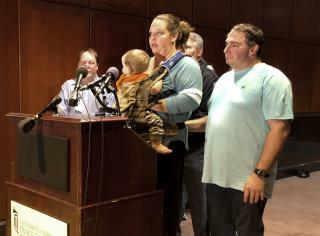 (Newser) – The parents of Jaelynn Willey, the 16-year-old girl injured in Tuesday's school shooting in Maryland, have made the heartbreaking decision to take her off life support. "As of now Jaelynn is still on life support but she will not make it," mother Melissa Willey told reporters at a Thursday press conference at the University of Maryland Prince George's Hospital Center, per the Baltimore Sun. "She is brain dead and has nothing, no life, left in her." "My daughter was hurt by a boy who shot her in the head and took everything from our lives," said the mother, her husband by her side and Jaelynn's infant sibling in her arms. She said Jaelynn was a member of the swim team and the second oldest of nine children. Something has change in the psyche of the young male youth. Used to be, when relationship ended, the guy would brood for a while, and even mourn. But now, he gets a gun and off's the female. Truly sick. They don't listen to elders anymore for guidance. What a shame. I wish people like this punk would just off themselves and leave others out of it.